Your beat-up coffee maker is begging to retire, or your cheap mixer has been overheating so quickly. It’s that time of the year again when you can score from the biggest holiday season sales, especially on small kitchen appliances. Get your first dibs on some of the best Black Friday deals you can benefit from. Right prep is key here- you can start by making a list and waking up early. Maybe this time, you will want to level up your coffee drinking game by upgrading to having your very own espresso machine. Perhaps you’re tired of slicing and dicing your vegetables by hand. And that’s why you deserve a reliable food processor that will speed up your meal prepping, whether it’s during weekdays or you’re celebrating on weekends. The top three things you should look for in a good food processor are the different blades for multiple functions, higher power wattage to accomplish tough cutting jobs, and bowl capacity. You can go for Cuisinart’s brushed stainless steel DFP-14BCNY 14-cup food processor, KitchenAid’s KFP1466ER in classic red, or Breville Sous Chef BFP800XL. The Hamilton Beach 12-cup is your great affordable option that can slice, chop, puree, and mix your ingredients in a flash. Indulge in some carb staples and even steam those healthy greens with the help of a trusty rice cooker. Having fragrant rice to complement those mouthwatering dishes to serve up your houseguests will surely make anyone’s day. The top three things you should look for in a good rice cooker are the fast cooking time, rice capacity depending on your household size, and the “keep warm” feature. The Panasonic SR-DF181 is a large-sized rice cooker with its classic and well-built design that may appeal to you. Or the versatile Instant Pot LUX60V3 with its 6 uses in one device. You might opt for a high-end kitchen helper with the Zojirushi NP-HCC10XH induction-style cooker. We mentioned earlier about how we want quicker food prep, so having a pressure cooker should be a no-brainer. No meat is ever tough whether you want to braise it or make a stew out of it in practically no time. The top three things you should look for in a good pressure cooker are the stainless steel construction, capacity for 15 psi, and the safety features. Fissler FISS-60070008079 Vitaquick is a solid choice which you can use on multiple stove types. If you prefer the electric kind, Geek Chef 8 quart is both a slow cooker and rice cooker in one. Mealthy MultiPot amps up the versatility game even further with its total of 9 functions. On the other hand, slow cookers are the perfect tools for your dump and go recipes. Although the word slow can be taken negatively, this device can be a lifesaver in your kitchen. The top three things you should look for in a good slow cooker are its even heat distribution, removable crock for hassle-free cleaning, and a glass lid to trap all the heat in. A KitchenAid KSC6222SS is an excellent option, while you won’t break the bank with Hamilton Beach 33969A given its unexpected meat probe feature. Don’t forget CrockPot SCCPMD1-CH, which consists of 2 pots in one heating unit that allows you to cook 2 dishes at the same time. If you don’t have a microwave oven yet, c’mon, you must be living under the rock. Whether you have yet to buy one or upgrade to a unit that has more bells and whistles, a microwave oven just makes everything so much easier. The top three things you should look for in a good microwave oven are higher power wattage for a much quicker reheating, pre-programmable settings, and capability for defrost and convection. A countertop microwave such as Toshiba EM925A5A-BS might fit nicely in your kitchen. And if you’ve been dreaming of something retro yet fancy looking, check out Sharp R-21LCF. Panasonic NN-ST696S is another good product that uses inverter technology. We love just about everything fried, don’t we? But, without a dedicated deep fryer, frying those chicken leg quarters can be messy and tricky. The top three things you should look for in a good deep fryer are the frying capacity, shorter time to heat up oil, and automatic shut off feature. You could be impressed by Bayou Classic 700-725 with its less oil requirement given the efficient V bottom design. DeLonghi D44528DZ Livenza’s high quality stainless steel exterior looks elegant and delivers more with its dishwasher-safe components. T-fal FR8000 packs in a lot power which makes deep frying much faster. 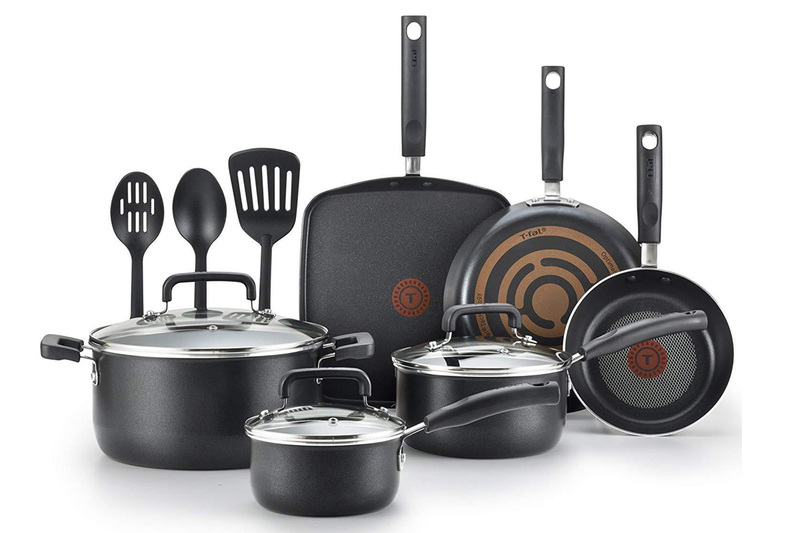 Buying quality cookware can be pretty confusing given a plethora of options out there. You, of course, need to have the basic pots and pans, and throw in a couple of specialty items for good measure. The top three things you should look for in a good cookware are its versatility such that, it can go from stove to oven to table top, easy grip handles especially if you’re buying the heavy duty kind, and durability. For those of you who prefer non-stick coating, you will like Cuisinart 635-24 Chef’s Classic. Lodge Seasoned Cast Iron 2 Skillet Bundle is the perfect kitchen combo while T-fal E765SC is the hard-anodized set you didn’t think you needed. If you think griddles are for bacon, pancakes and eggs, you got it wrong. Griddles are just as great for browning and crusting meats like chicken and steak. The large surface area with no sides makes flipping food easier. What you should look for in a good griddle is the one with welded plates that have no gaps. You might also prefer chrome griddles which are energy-efficient. A Lodge 10.5 Inch is excellent for pizza and pancakes with its round shape. If you like the electric version, the Presto 07211 could be for you. Chef’s Design Maxi Griddle has Excalibur coating – considered as the most durable nonstick material. Can you imagine baking your favorite cake without a mixer? This indispensable tool makes smoother textures and consistency possible in your delicious pastries. The top three things you should look for in a good stand mixer are the sturdy construction, does not overheat easily and availability of different attachments. What is a good baker without a Kitchenaid stand mixer? The KitchenAid KSM75SL Classic Plus has the powerful motor KitchenAid is known for but is much more lightweight than the other models. If you want something that’s more budget friendly, but does not trade quality, go for Cheftronic or Cuisinart SM-50. Smooothies and milk shakes would not have been born without a kitchen blender. For most of its variants, a blender is also capable of chopping most ingredients and creaming of soups. The top three things you should look for in a good blender are its multifunctional features, motor that does not overheat easily, and added safety precautions. Vitamix A2500 is a good investment piece for high performance blending action and more as well as Blendtec Classic 575. An affordable alternative that has ice-crushing capabilities is the VAVA Professional Countertop Blender. Don’t rule out KitchenAid Diamond Vortex in your “for consideration” list. Juicers have become part of a health nut’s arsenal. And if you haven’t jumped in the juicer bandwagon yet, now is as good as any time, especially if you can take advantage of season deals. The top three things you should look for in a good juicer are the ability to get a higher yield, ease in operation and cleaning, and one that can handle a variety of produce. Breville BJE200XL has a good price point which is simple to use and juices quickly. For a masticating juicer, check out Aicok Slow Masticating Juicer. Another slow juicer that would be worth your attention is the Hayke Slow Masticating Juicer Extractor. Are you one of those that drinks coffee to boost his morning? Or are you just someone who loves to have his cup of joe any time of the day? With so many deals available, you can even buy 2 different units just because you can. The top three things you should look for in a good coffee maker are durability, user-friendliness, and speed in brewing. Keurig K-Cafe is a good coffee capsule machine with simple control buttons. If you like a drip-style coffee maker, Zojirushi EC-YSC100 will satisfy your coffee cravings in a flash. Cuisinart Grind & Brew has an integrated grinder and it is fully programmable. Making bread is made less complicated – thanks to the invention of the bread maker. But you must know that not all bread makers are created equal. Some bread could come out sunken or misshapen. The top three things you should look for in a good bread maker are having the right browned bead, faster bread making times and how easy it is to use. SKG Automatic Bread Machine, Vivreal, and T-fal ActiBread. But if you are going big this Black Friday, prepare to shell out several hundred dollars for Panasonic Home Bakery. You know how easy it is to recreate those fancy waffles you buy at restaurants when you have your own waffle maker. The day seems brighter when you’ve just had that whole-grain waffle in the morning. The top three things you should look for in a good waffle maker are the adjustable settings on how browned you want your waffles, nonstick plates, and weighed lid for that perfect waffle grid. You can have a look at Cuisinart WAF-300 which has 4 plates each for waffles and pancakes. Be wowed by Breville BWM604BSSUSC with its heavy-duty design. And you will not miss NordicWare 15040 waffle-shaped waffle maker. I’m sure you have already marked the items you’ll get to spruce up your kitchen countertop or replace your old small appliances. Aside from Black Friday deals that stores will be offering, be ready to swipe your plastic to maximize your benefits from your card issuers. Don’t forget to set a budget and stay on it. Remember that most of these initial deal announcements will be made a lot sweeter within days leading up to the Black Friday event. Keep your eyes peeled and ears attuned to even more crazy deals that can only happen during Black Friday. Happy shopping!